Do you know how many times I have made these spoons? A LOT! I debated over if I should share them or not, they are so easy and honestly, does one really need directions? Well, you see which voice won my inner battle, eh? I love cookie trays, I really do. I do not like brown cookie trays. This is all old news, but you know the ones that are all brown cookies, dry looking, mystery crumb stuff that you feel like you shouldn't even eat? The unidentifiable stuff, the dry, choking hazard stuff, it is just a bummer. I like adding fun things like this to trays. Maybe even some marshmallows, or find an old fashioned glass jar, add some cold milk and deliver it ASAP with a bunch of these spoons. Maybe a bag of popcorn too! How fun is THAT? I might have stirred one of these into my Boston Cream Coffee this morning, and it might have been amazing. I do hope you give them a try. Oh and for the record, I saw these in a store recently, they had candy sprinkled on top. I don't know about you but I am not about to have floaties in my drink. DOWN WITH FLOATIES. Ewww! 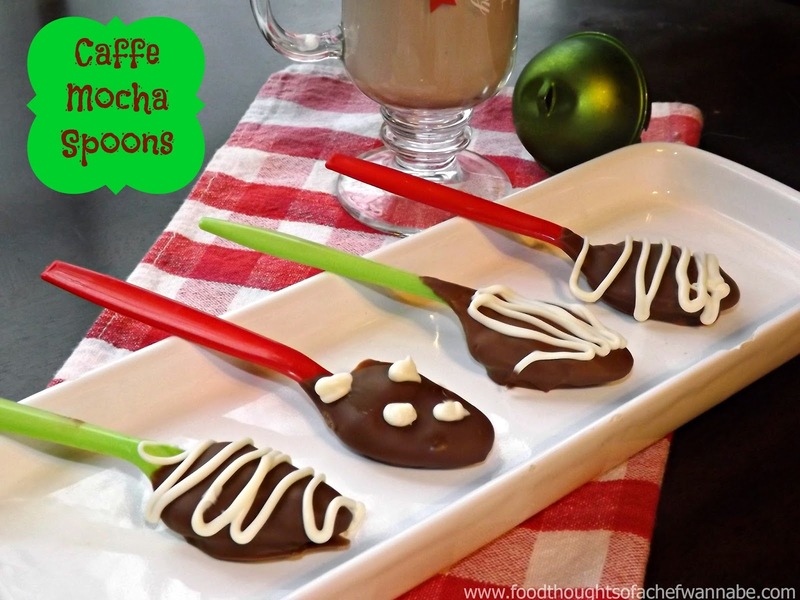 Melt 1 cup of milk chocolate chips either in a microwave, 30 seconds at a time or in a double boiler setup. When it is completely melted, stir in the instant coffee granules. When mixture is all combined, use a butter knife or another spoon and fill the spoons up with the mixture. Level them off at the top or leave them a little higher, the choice is yours. Set on a parchment paper lined cookie sheet until all are done. Refrigerate for 1 hour. Now, melt the remaining milk chocolate, and dip each spoon in and give it a full turn, covering the coffee/chocolate mixture. Let the extra chocolate drip off and place back on parchment. Let sit until hardened. (You can place back in the fridge). When they are set, melt the white chocolate and using a spoon or piping bag, zig zag, polka dot, or curly que your way to completion! While I did not show it in the photo, if you are using these as gifts, attach a tag that says to stir 6-8 ounces of hot milk. Let the spoon sit for a few seconds and then stir. You will enjoy a cup of chocolaty, coffee, warm goodness! Could you also add mint or vanilla flavoring? Absolutely Shannon, just make sure to add it AFTER you have mixed the instant coffee granules in so that your chocolate won't seize up! Great idea!! Merry Christmas!